When friends descend on Round Top, Texas, for one of the biggest antiques fairs in the country, their family-style outdoor dinners are as color-filled as the surroundings. 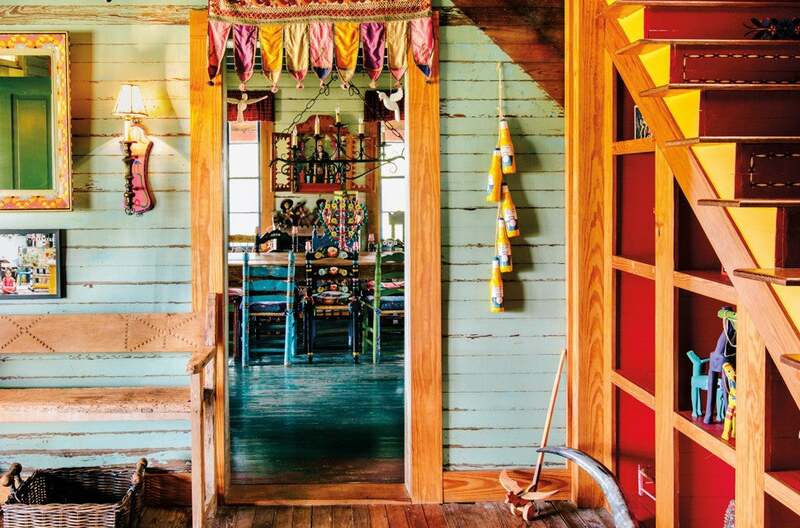 Magic is a word that comes up a lot when you talk to people about Rancho Pillow, a creative guesthouse compound just outside Round Top, Texas. The 20-acre property features a variety of eclectic lodging options, including a private teepee lined with hand-painted murals, a storage shed-turned-casita called the Love Shack, and an 18th-century barn that was relocated from upstate New York. But what really adds to the funky vibes and kaleidoscopic style is the fact that several of the pieces, from the bedroom furniture to the artwork to the name (which was scrawled on a 1940s neon sign), come from the Round Top antiques fair, a twice-yearly extravaganza that turns a 17-mile stretch of Texas Highway 237 into a vintage lover’s dream. Rancho Pillow is the work of Sheila Youngblood, a wildly colorful soul who is the walking embodiment of the property: “What I wear, what my spaces look and feel like—these are expressions of my own heart,” she says. But what really adds to the funky vibes and kaleidoscopic style is the fact that several of the pieces, from the bedroom furniture to the artwork to the name (which was scrawled on a 1940s neon sign), come from the Round Top antiques fair, a twice-yearly extravaganza that turns a 17-mile stretch of Texas Highway 237 into a vintage lover’s dream. Rancho Pillow is the work of Sheila Youngblood, a wildly colorful soul who is the walking embodiment of the property: “What I wear, what my spaces look and feel like—these are expressions of my own heart,” she says. The compound, which was formerly Youngblood’s family’s second home (they’re based in Austin, just over an hour’s drive west), has hosted dozens of events in high style over the years—300-person weddings, grand birthday parties, and raucous high school reunions—but family-style dinners held outside in the ﬁelds have become a signature of sorts. A ticketed feast is open to the public during each Round Top season, and Youngblood also throws intimate gatherings for friends in town—such as Austin-based designer Claire Zinnecker, a Rancho regular who brought a few new recruits during her last trip. With ﬂorals prepared by another friend, Virginia Lyons, and a tablescape curated from Youngblood’s vast collection of Round Top pieces, the special evening was a natural marriage of Zinnecker’s bright, bohemian aesthetic and Youngblood’s unique brand of whimsical maximalism. Here’s how the meal came together. For the fig hibiscus sauce blend ingredients in a blender until smooth. Serve poured over the figs and sprinkle with olive oil and flake salt. 1. Shave watermelon radish thinly on a mandoline. Set in a glass of ice water to keep radish fresh and to curl edges. 2. For the vinaigrette, put all ingredients in a blender, or whisk together until emulsified. 3. Pickle the cauliflower the day (or at least a few hours) before using this method: Fill a large Mason jar with the cauliflower florets. Add garlic and miso, and cover with Ume vinegar (use as much as you need). 4. To serve, place the cauliflower and watermelon radish on top of the tomatoes and garnish with Maldon or Jacobsen salt. Stop by Rancho Pillow during the spring 2018 Round Top antiques fair, taking place April 2-7, and check out Zinnecker’s guide to the fair here. This story originally appeared in the Spring 2018 issue with the headline Home on the Ranch.